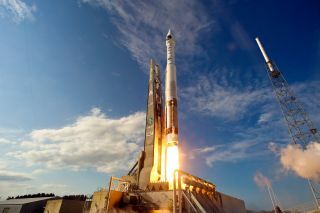 WASHINGTON — The U.S. Air Force launched the second satellite in its next-generation missile warning constellation Tuesday (March 19) from Cape Canaveral Air Force Station, Fla. The satellite, known as GEO-2, is the second dedicated satellite in geosynchronous orbit in the Space Based Infrared System (SBIRS) and was launched aboard a United Launch Alliance Atlas 5 rocket. "We are confident this satellite will meet or exceed expectations and play a pivotal role in our national security for years to come," Jeff Smith, Lockheed Martin's vice president of Overhead Persistent Infrared (OPIR) mission area, said in a press release. Lockheed Martin Space Systems of Sunnyvale, Calif., is prime contractor on the multibillion-dollar program. Northrop Grumman is the payload manufacturer. "Today's successful launch of the GEO-2 satellite marks another milestone in the evolution of infrared surveillance from space," Stephen Toner, Northrop Grumman's vice president of the Military and Civil Space business area, said in a prepared statement Tuesday. "The team played a significant role ensuring that the sensors on GEO-1 are performing beyond specification, and we are confident that the GEO-2 sensors will exhibit similar performance." When fully deployed, the SBIRS system includes four dedicated satellites in geosynchronous orbit, infrared sensors hosted on classified satellites in highly elliptical orbits, and a network of ground stations to receive, process and distribute the data. SBIRS is the replacement for the Defense Support Program constellation of satellites that have provided missile warning since the early 1970s. The newer satellites, featuring scanning sensors that cover large swaths of territory and staring sensors that focus on smaller areas of interest, are expected to significantly improve the Pentagon's missile detection and military-intelligence gathering capabilities. In particular, the SBIRS craft are expected to be much better than their predecessors in detecting launches of relatively short range missiles. GEO-1 was launched in May 2011 and has troubled Air Force officials with an intermittent communications glitch. Air Force officials and Lockheed Martin executives have said they do not expect the problem to resurface in GEO-2. The third geosynchronous satellite, GEO-3, is expected to launch in 2015, with the fourth to follow about a year later. Air Force officials expect to issue production contracts for the fifth and sixth dedicated satellites later this year.